Kotobukiya's ARTFX STAR WARS lineup continues with characters from STAR WARS Episode VII: The Force Awakens starting with none other than Kylo Ren! 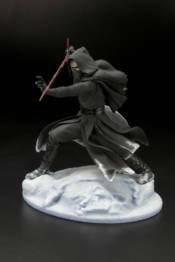 Kylo Ren looks great in this beautifully sculpted 1/7 scale statue, standing on a snow-themed base sculpted to hint at the shape of Darth Vader's destroyed helmet Kylo Ren strikes a wide, stable stance, holding his unique lightsaber (with LED light up features) raised to attack those who oppose the First Order. With the ARTFX line's easy snap-fit assembly, Kylo Ren is ready to display in seconds! Display along with other ARTFX+ statues based on characters from STAR WARS Episode VII: The Force Awakens such as the First Order Stormtroopers or Captain Phasma!